Several years ago, I met Darwin Aquino by phone…out of the blue my pianist friend Daniel Daroca decided to call him, without any previous introduction. We had found his blog on the internet, and saw that he was the director of a youth orchestra in Dominican Republic, along the lines of “el sistema” from Venezuela. Gleaning over the blog, we also saw that he was also composer and violinist. Several years later, we met in person when he was celebrated in a composer showcase concert produced by the Association of Dominican Classical Artists in New York City. We spoke briefly about him writing me a piece, using texts by a Dominican female poet that I would need to research and elect. At the time I had struck a friendship with Dominican York poet Marisol Espaillat. I told Marisol I needed help identifying a female Dominican poet that I could look into for texts for this new composition for voice and piano. We met at Caliope (since closed), a Dominican bookstore in Washington Heights, where I made several purchases, but I did not take my research further at that time. Pianist, composer and director of North South Consonance Max Lifchitz knew of my friendship with Darwin. Upon receiving a special grant from the University of Albany to do a special concert, master class and talks regarding inclusion of minorities in classical music, he suggested I collaborate with Darwin in creating a new piece we could premiere on October 27th, the season opening concert for North South Consonance in Manhattan. The concert would then be repeated at the Performing Arts Center in Albany (NY) on October 29, 2013. With a firm date and project on hand, I had to get serious about finding texts for this new song cycle. I came across the poem “Mi vaso verde” by Altagracia Saviñón (1886-1942) via my friend, the painter and theater designer José Miura. He mentioned that Saviñón is considered the first “symbolist” poet of Dominican Republic. Chronologically coinciding with the time period of the French Symbolists, hers is a melancholic story: a poet of great promise, composing her best most well-known poem at age 17, at an early age exhibited signs of mental illness and lived most of her adult life in an insane asylum, victim of an apparent schizophrenia. Her whole reputation and place in the canon of Dominican literature is based on this poem, which translates into “My green vase”. José wrote the poem in a beautiful card in his own hand writing, which I still conserve. I sent the poem to Darwin, and he was immediately enchanted by the text. Still needing a second poem, I posed my question to painter and writer Fernando Ureña Rib, who suggested the moving poem by Dominican female poet who’s nome de plume was “Carmen Natalia”. 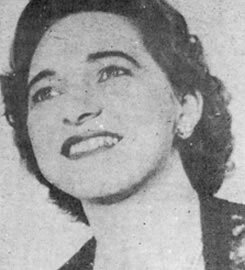 Carmen Natalia Bonilla Martinez (1916-1976), in contrast to Saviñón, realized a full life, in which she became a writer of great distinction in prose, poetry and theater, and became both an early feminist and political dissenter to the then dictator of Dominican Republic Rafael Leonidas Trujillo. 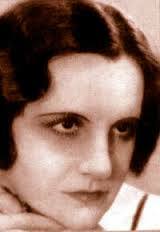 Carmen Natalia emigrated to Puerto Rico, and she was promptly “erased” from the literary canons of her country. After the death of said dictator she returned to Santo Domingo, and presently has been recognized as one of the great Dominican poets. Fernando suggested I use “Poema de la eternidad cansada”, in which the symbol of an old dress is used to bring out the hypocrisy of societal hypocrisy, and the themes of imposed societal and cultural roles upon women. With Darwin’s interest in historical subjects and themes in his composition, both of these poems provided the source of inspiration he needed. The result is a brief cycle entitled “Perfume”, comprised of three songs: I Las Flores II Eternidad Cansada III Mi vaso verde. The composer choose to interpose these two poems, making a synthesis that is dynamic, in which one text leads into the other seamlessly. The first song is built on an almost naïve happy melody that repeats in a joviality and lightness that changes almost abruptly into the miniature “Eternidad Cansada”, which is only four bars long. Marked Libre, con angustia on repetitive notes, the song follows immediately without a break into the hypnotic and final “Mi vaso verde”. This last song, the most haunting of the cycle, has a repeated leitmotif of two falling notes C# and A natural, echoed throughout as well as directions for the mezzo-soprano to strike two water filled glasses on stage, that play these actual pitches. Recitative like, with indications for certain passages to be done without vibrato, in some instances in Sprechstimme, the last two pages have a dramatic climax, the first to a high b flat, and the second and final into a repeated ostinato that in my imagination, emulates the laughter of the maddened Altagracia Saviñón. Although the songs have a modern aesthetic, they never approach atonality; they are almost expressionist and explore the possible harmonic and vocal effects that help bring out these texts in the most dramatic way possible. “From these lines from which emanate these three songs, are reflexions about life and death. Interpreted without interreption, the cycle begins with “Flowers”; this text represents “existence” (perfume) of the flower that is bound by water (life) contained in “My green vase”, the dramatic song which concludes the cycle. The second song, “Eternal Tiredness” symbolizes death and unites the title of the poems by Martinez Bonilla and Saviñón”. I asked the Spanish artist and graphic designer friend Sergio del Toro to help me with a design of a promotional image for my upcoming concert of Latin American Song: A Panoramic View with pianist/composer Max Lifchitz in Manhattan with North/South Consonance, Inc. this coming October 27th. 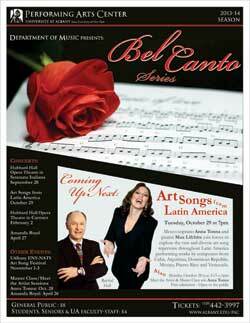 The recital is comprised of composers from all over Latin America. The idea of the map was mine, but Sergio developed the idea of the interconnecting lines symbolizing how Latin America is united through culture, language and of course music. “Anna tenía muy claro lo que quería reflejar en la imagen. La idea inicial del cartel era mostrar un mapa al estilo de las antiguas películas de aventuras, una especie de ruta de viaje a través de los países de Latinoamérica, en busca de un tesoro musical, con un toque “vintage”. Tras haber realizado un primer cartel y tener el visto bueno, no pude dejar de darle vueltas, de imaginar un mapa diferente. Finalmente, intentando respetar la idea inicial, pensé en las canciones cómo hilos de unión para dibujarlo, tejido por las canciones, la colorida y cálida multiculturalidad siendo guiados, además, por la rosa de los, vientos. Así entre varias comunicaciones en la diferencia horaria, se creó la imagen del concierto”. Anna had a clear idea of what she wanted the image to reflect. The initial idea was a poster that showed a map in the style of the old adventure movies, a sort of trip route thru the different countries of Latin America, in search of musical treasures, with a vintage touch. After making the first prototype and seen it as a good effort, I could not stop thinking of a new idea and imagining a different kind of map. Finally, trying to respect the original idea, I thought of the songs as threads of union to draw (the map), knitted by the songs, colored with the quality of multiculturalism that are guided, besides, by the compass rose. So it was, with our various communication efforts and difference of time between NYC and Spain, the image of the concert came into being. Always on the look out for new songs to sing by Latin American composers, I had the opportunity to meet Dr. Luis Carlos Rodriguez Álvarez in Medellín (Colombia) in 2010. I was at the time singing the role of Adalgisa in a production of Norma for the Fundación Proliríca de Antioquía in September of 2010. Speaking to the fellows in the chorus who were mostly university students, they introduced me to their favorite professor, the lively and enthusiastic Dr. Rodriguez Álvarez, and we met in the center of town. During our spirited meeting he gave me an important cache of songs for voice and piano spanning from the early 19th century to the mid 20th century. Over coffee we chatted about his work at the university. Dr. Luis Rodriguez Álvarez champions the classical composers of Colombia, teaching music history courses at the University of Medellin, and is involved in the recuperation of the historical memory of the composers that were important in the musical culture of Colombia. I had only two names that I knew of, the composer Jaime León, b. 1921 (I have been singing his song “La campesina” for years) and a female Avant-garde composer active in the 60’s and 70’s called Jacqueline Nova (1935-1975). After this meeting, I had a better bird’s eye view of the musical culture of Colombia which is important and extensive…so far here in the States it is fairly easy to acquire the songs by León, which where edited by Patricia Caicedo (Editorial Tritó). Both “La campesina” and a song by Jacqueline Nova called “A veces un no niega” are in a book edited by Kathleen L. Wilson called “The art song in Latin America” (Pendragon Press). As far as I know, these are the easiest obtainable sources of art songs by Colombian composers here in the U.S. Both music books can be bought thru Classical Vocal Reprints, my favorite place for hard to find vocal music. Antonio María Valencia (Cali, Colombia 1902-1952). La pieza titulada La luna sobre el agua de los lagos… fue escrita el 11 de agosto de 1932 y es la tercera de su ciclo titulado Melodías para voz de mujer y piano sobre textos del poeta Otto de Greiff (1903-1995). Sobre ella escribe el maestro Mario Gómez-Vignes, biógrafo de Valencia: “Como las dos anteriores (Tres días hace que Nina dormida en su lecho está… e Iremos a los astros…), esta canción es tenue, otoñal, elegíaca. Es curioso, la voz solista nunca sugirió a Valencia otros sentimientos diferentes. Su escaso repertorio vocal –con excepción de las obras corales-, contando las canciones de adolescencia, están siempre teñidas de languideces y melancolías. Es, tal vez, la cuerda que más afinidad guarda con el profundo fondo de su carácter. Una vez más estamos ante una estructura ternaria que apela al uso de la variación libre. El lenguaje armónico es triádico, pero revestido de absoluta independencia, denotando que el compositor ha ido evolucionando desde una etapa libremente tonal a un pantonalismo no funcional que lo relaciona directamente con las conquistas de sus colegas latinoamericanos contemporáneos. Las figuraciones envolventes y los modelos rítmicos en ostinato dejan entrever una sostenida línea de conducta que convierte a estas tres canciones en una especie de ciclo, pese a que las temáticas poéticas son diferentes. Se podría hablar de ciclo en el sentido de unidad en la traducción poético-musical que hace el compositor con los versos de Otto de Greiff. La luna sobre el agua de los lagos… está dedicada a Ninon Vallin, célebre cantante francesa a la que Valencia escuchó en París, pero a quien nunca acompañó en sus recitales”. Me alegra mucho saber que usted cantará el ciclo completo de las Canciones de Valencia. Él es un gran compositor, quizás injustamente olvidado. Valencia conoció personalmente a la cantante francesa Ninon Vallin, la escuchó en París, pero nunca la acompañó al piano, como a otras de esa época. Los amigos de Valencia en París fueron principalmente sus maestros Vincent d’Indy y Paul Braud, y su mejor amigo, compañero, condiscípulo, casi hermano, fue Joaquín Nin Culmell, además de la hermana de este, la famosa Anaïs Nin. Sobre el ciclo dedicado a poemas de Otto de Greiff, debo decirle que yo fui amigo personal de don Otto, y él mismo me comentó que estas Canciones fueron un testimonio de mutua amistad. 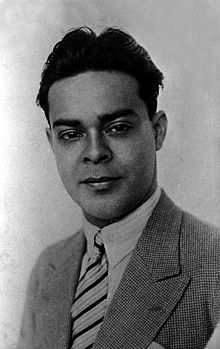 Don Otto fue el hermano menor del gran poeta colombiano León de Greiff, famoso en la lengua española. Don Otto también fue gran poeta en su jeventud, pero mucho menos conocido. Con la señora Ilse de Greiff, la hija de don Otto (quien anteayer cumplió 18 años de haber fallecido, a los 92 años de edad) hace algunos años recogimos toda su producción poética en el libro Grafismos del grifo grumete. I found out with great interest that during his time in Paris he knew several of the Spanish composers that I have an interest in and study. He was best friends with Joaquín Nin-Culmell, son of pianist and composer Joaquín Nin Castellanos and of course brother of (my favorite author) Anaïs Nin. 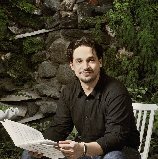 Maestro Valencia, who had an un paralleled musical culture, a recognized trayectory as a pianist virtuoso in Paris as well as a well known composer across all genres, founder of the most important musical organizations still operating in his native Cali was sadly misunderstood, unappreciated and forgotten. The school that bore his name was renamed, a bust erected in his memory was taken down. He has been justly recuperated by these recent efforts, and is being recognized as the most important musical figure to come from Colombia in the first half of the 20th century. I only programmed one of his songs, it will be featured in the first half of my program, between a Manuel Ponce cycle and another cycle by Venezuelan composer Modesta Bor. I have plans in the future to learn and perform the entire cycle by Antonio María Valencia to the poems of Otto de Greiff, the Melodías para voz de mujer y piano. There is one recording that is available on Amazon by soprano Emperatriz Figueroa, although there are other recordings by soprano Patricia Caicedo and the great Colombian mezzo soprano Marta Senn.